This Extra-Tall Arch Provides An Attractive Archway For Climbing Plants To Create A Beautiful Entry Into Your Garden. Gently Curving Structure Forms An Archway Topped With Gothic Inspired Spires At Either End. Horizontal Bars Connect Vertical Sides To Each Other Producing A Sturdy Structure. Horizontal Bars In The Top Portion Serve As An Ideal Place To Hang Lightweight, Potted Plants. 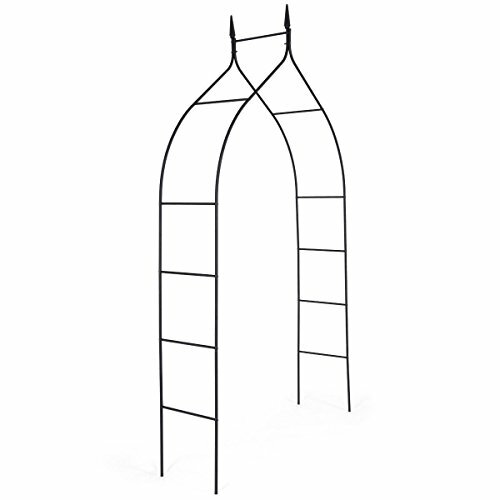 This Arch Is Perfect For Supporting Lightweight Climbing Plants And Vines Or For Displaying Small Hanging Accents. Train Your Plants To Grow Through The Arbor By Weaving Them In And Out Of The Structure As They Grow. Sturdy Tubular Steel Frame Construction; Powder Coated In A Durable Black Polyester Epoxy Coating. Black Coloration Will Blend With Any Surrounding. If you have any questions about this product by Allblessings, contact us by completing and submitting the form below. If you are looking for a specif part number, please include it with your message.